ControlByNet (CBN), a leader in cloud-based hosted video security surveillance solutions, announced today the addition of TerraCloud Inc. as a new integrator for CBN’s i-flashback REMOTE. ControlByNet’s i-flashback REMOTE, one of the most advanced hosted solutions on the market, provides web-based controls for video hosting providers and enterprise customers to host video across multiple servers, users and accounts. Based in Central Floridaand serving customers across the country, TerraCloud provides IT solutions for small businesses, government agencies, and Fortune 500 enterprises. TerraCloud is now offering i-flashback REMOTE to customers in the Central Florida area including metropolitan Orlando and the surrounding counties ofOrange, Seminole,Lake, Brevard, Volusia and Osceola. The February issue of SDM focuses on Security Cloud Computing. The article states that security cloud computing (SCC) is changing all aspects of security from how it is sold, to delivered and used to how it is valued by customers. SDM’s Industry Forecast Study found that 60 percent of dealers and integrators are offering remote video monitoring and 25 percent are offering hosted (cloud-based) video storage/viewing. SCC has a long history in the residential alarm market and a bright future too, by eliminating a deal-killing capital investment and moving the video storage offsite and eliminating the risk of the DVR and contents being stolen or destroyed. One example includes ControlByNet working with a homeowner’s association. HOA members and security officers are able to view live and on-demand video from any location. Will the DVR Shortage Push Integrators to the Cloud? IP-based surveillance is expected to continue to grow in 2012, but could the DVR shortage help push hesitant integrators on the“cloud.” The catastrophic flooding in Thailand in August has resulted in a DVR shortage which is impacting surveillance integrators. It is estimated that the best prices for DVRs may increase more than 10 percent. With IP-based surveillance, integrators and their clients no long have to worry that a DVR is broken or missing. At the same time, integrators can benefit from new business opportunities including offering flexible hosting solutions, enjoying recurring revenue and adding monitoring and guard station solutions. However, integrator education is still a missing piece of the puzzle. With ControlByNet’s i-flashback solution we help integrators make the move from analog to IP easy. Our i-flashback solution allows integrators to step into the IP surveillance and hosting business slowly by having ControlByNet’s do the initial hosting. This minimizes initial investment while allowing integrators to offer their customers a hosted IP solution. As integrators grow their businesses and learn the system they are able to move the hosted cameras to their facility seamlessly with no customer interruption. The time is now for dealers and integrators to find the right IP solution to help them take their customer to the cloud and the DVR shortage just might help some integrators make the move. Prepared for the Future or Left in the Past? Cloud-based video surveillance continued to grow in 2011, however there are still integrators and customers hanging onto their DVRs. Beyond the challenges of having a broken or stolen DVR, this old technology limits users ability to have access to their video on the browser and device of their choice. Many of the DVR’s out there are set to use ActiveX only which means these users can only use Internet Explorer. Some of them will accept using a Firefox browser, but looking at a recent report of ours it is clear that Internet Explorer and Firefox are leaving lots of users out. 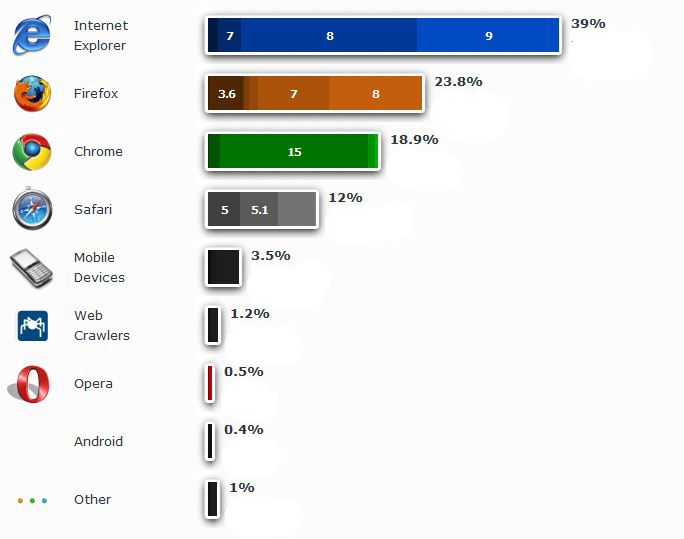 Only 39% of our visitors use Internet Explorer and even with Firefox you’re only at just over 60%. That’s a lot of people out there who couldn’t access a DVR with their preferred browser client like Safari and Chrome . Cloud-based software like our i-flashback provides a future proof solution for customers. As we update our products our customers are also updated- seamlessly. People are upgrading faster; part of it choice and part of it the software constantly reminding them of an upgrade version available. Your security should keep up with latest technology and not be tied to current or even older technology. You are currently browsing the archives for the i-flashback category.